If you’re here, you most likely are hiking to the bottom of the Grand Canyon! My hike to Phantom Ranch last summer was one of the best experiences of my 13 years, even though it was also probably the hardest things I’ve ever done. I’ll always remember how much my feet hurt afterwards, but also the beautiful views and amazing times. So, I’ve decided to write this post to let anyone hiking to the bottom know all of my highlights of our hike, so nobody misses anything that made my experience at the Grand Canyon so great!! 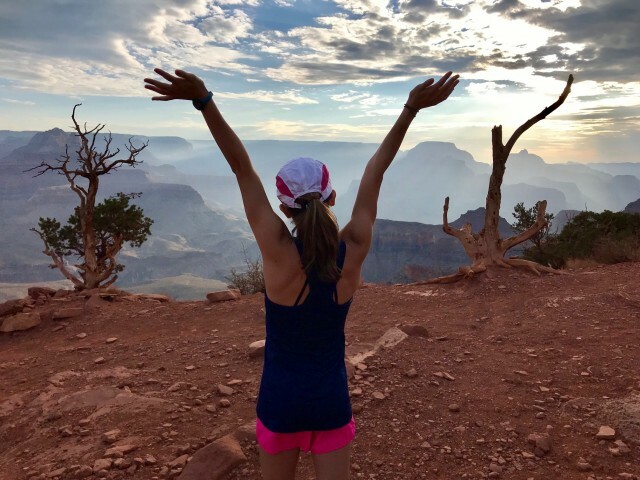 (just to let you know – this post won’t tell you any of the essentials you’ll need for your hike – but you can find that out here in my post 5 Tips and Tricks for Your Hike into the Grand Canyon). Most likely, if you’re hiking down to the bottom of the Grand Canyon, whether you’re staying at Phantom Ranch or camping, you’ll be leaving pretty early in the morning. When we hiked down last August, we woke up around 4:00 in the morning, to head over from our hotel on the rim to catch our early morning hiker’s bus at 4:30. By the time we got to the head of South Kaibab trail, the sun still wasn’t up. As we started our exciting hike down, the sun began its ascent just as we reached our first view point – Ooh Aah Point. We were able to capture some beautiful pictures, and loved our first view inside the canyon. 2. Dip your hats in the river! Hiking down South Kaibab Trail, it’s going to get hot. Especially by the time you cross the bridge over the Colorado. So, when you finally reach a branch of the Colorado on your way to your camp site/Phantom Ranch, you’re going to be pretty hot and sweaty. We had the idea to dip our hats into the river, get a scoop of fresh water, and splash it onto our heads. This simple act helped us cool off tremendously and the cool water on our hair felt amazing! 3. Go to a Ranger talk at Phantom Ranch! Although the meals at The Canteen in Phantom Ranch are reserved just for people with a cabin reservation, anyone can go to one of the Ranger talks during the day or at night. These talks are super interesting and fun! The ranger will likely talk about the geography of the canyon, or maybe some species that live in it. They also will answer any questions you have about the canyon’s history, geography, or anything else that crosses your mind! It’s also super interesting talking to the rangers, because these people work in the canyon, and have hiked in and out many times, so they’re super experienced and generally cool people all around. Inside The Canteen (which anyone can go in besides at the meal times), you can find a packet to get your Junior Ranger badge! If you can’t find it, ask one of the workers at The Canteen where you can find one, and they’ll point it out for you. The packet does take some time to complete, but it’s definitely worth it. The questions are all pretty open ended, and there’s not really one right or wrong answer. When you ask a ranger to check your packet to approve it and give you your badge, as long as you seemed excited about the canyon and can list some things you learned/why you loved your experience you’ll definitely get it. Please do NOT be put off by the slightly long packet, because the Phantom Ranch Junior Ranger badge is sooo worth it! It’s a super cool circular patch with a rattle snake on it that says Phantom Rattler and Phantom Ranch Junior Ranger on it. 6. Stargaze outside of your cabin/tent! The entire Grand Canyon area is really conscientious of their effects on the environment, so they have special lights that minimize light pollution. This, along with the fact that there won’t be much light on in the middle of the night given your at the bottom of the Grand Canyon, causes the stars to be super bright, beautiful, and AMAZING! We naturally woke up in the middle of the night, but if you don’t have confidence that you’ll wake up after your long hike, you can set an alarm for anywhere between 1:00-3:00 AM to go stargazing. When I say stargazing, I don’t mean anything organized or official. All you need to do is walk out your cabin door to see an entire arm of the Milky Way, and thousands (at least) of magnificent stars shining brighter than you could possibly imagine. This was amazing for me because I am someone who LOVES space and science, especially anything to do with stars, so it was so so so cool to see all these stars in the night sky!